I’ll shut up about work for a minute and jog you through a few other notable goings-on in McCarthy and Kennecott. 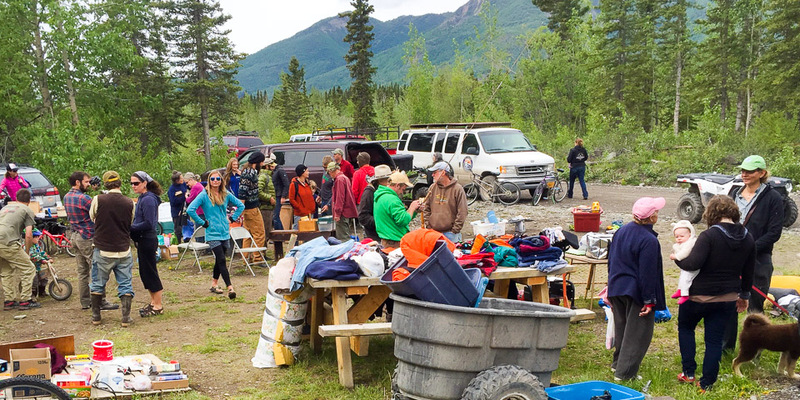 Three weeks ago (June 4th) McCarthy held a community yard sale. Anyone looking to free up valuable storage space could get rid of unused clothes, blankets, and knick knacks. Alaskan residents are permitted to fish 500 salmon per year from the Copper River (north of McCarthy Bridge). Those 500 fish must be for private use only. 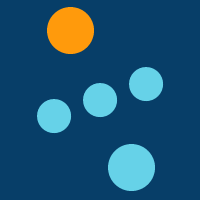 Individuals cannot sell their fish unless they have a commercial license. This means that a lot of salmon is gifted to friends. 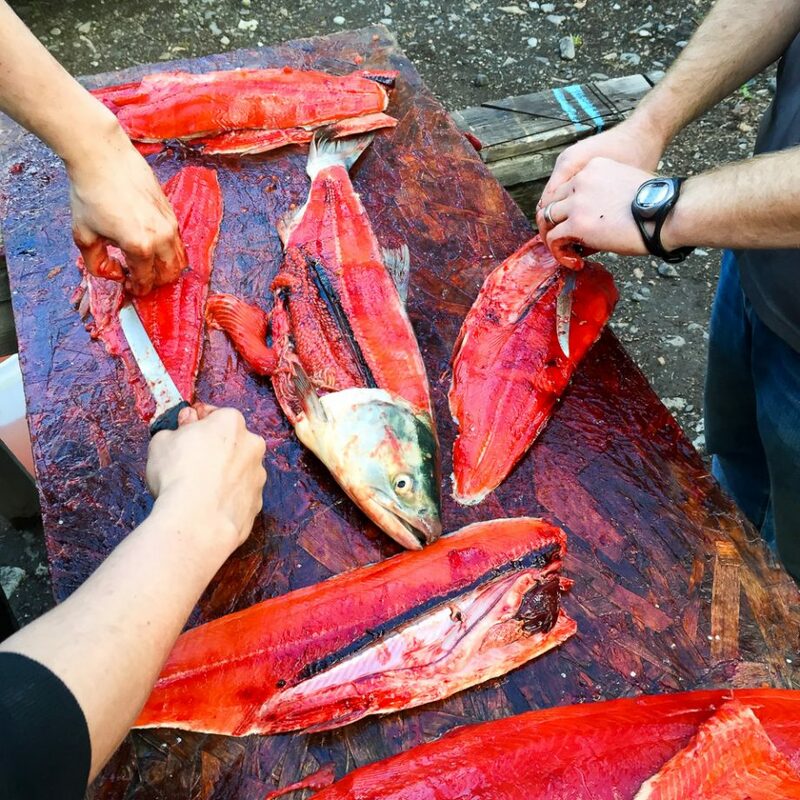 Twice now we’ve gotten a call about fish out of Chitina. 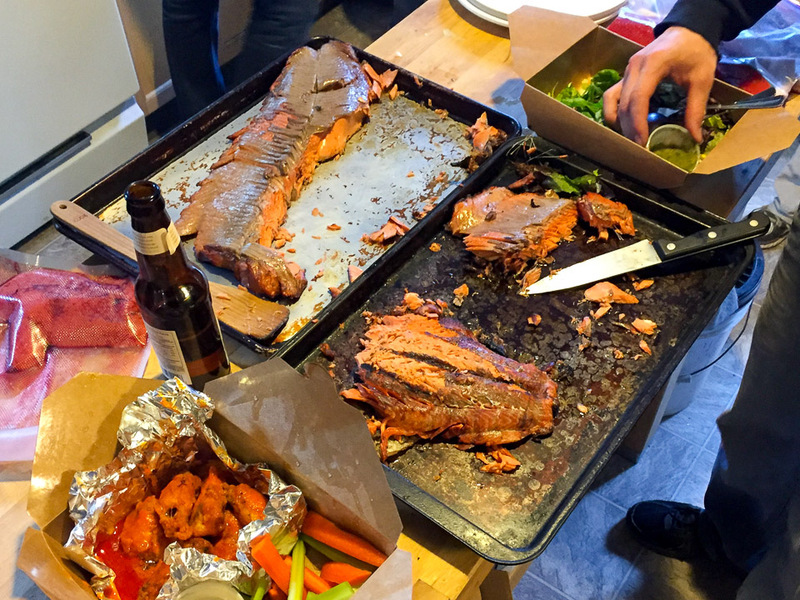 We fly them back that evening and have an impromptu fish cleaning and cooking event. – An exciting thing to see unfold for this beach bum from Orange County. There’s not too much to filleting these fish, but it’s a technique intensive skill. Essentially, you pull the knife from the tail to the head keeping it as close to the spine as possible. Then you make a vertical cut down behind the gills to completely separate the fillet. Once the two fillets are cut you discard the guts, head, and backbone. Lastly, remove the blood vein (black line in picture) and cut off the dorsal or pelvic fins if they’re still attached. The skin stays on. If you know what you’re doing you can remove the ribcage from each fillet. I don’t so I didn’t. The cutting, cleaning, and packaging took the 8 of us about an hour to complete. There’s something special about having an unplanned crew dinner at 10pm on a work night. 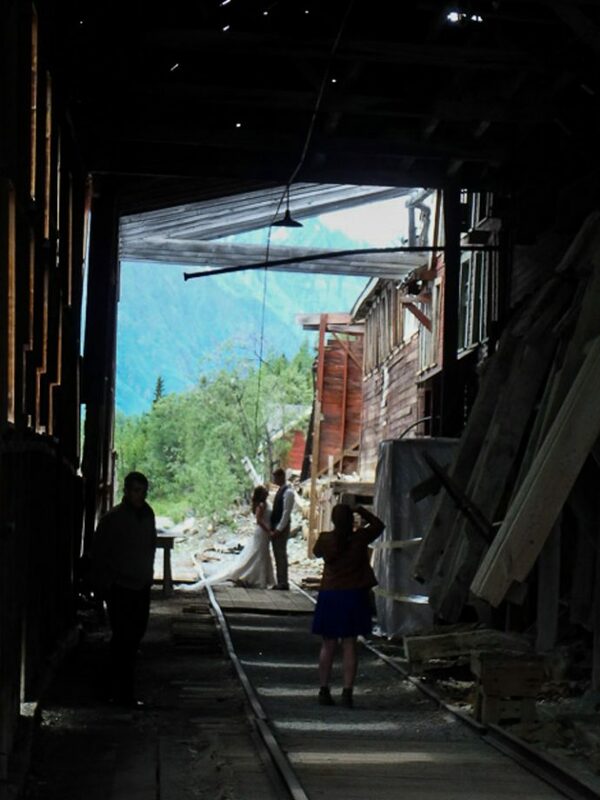 Wedding photo shoot in Kennecott. Summer Solstice is a big deal in Alaska. It holds weight as the delineation between summer approaching and winter encroaching. 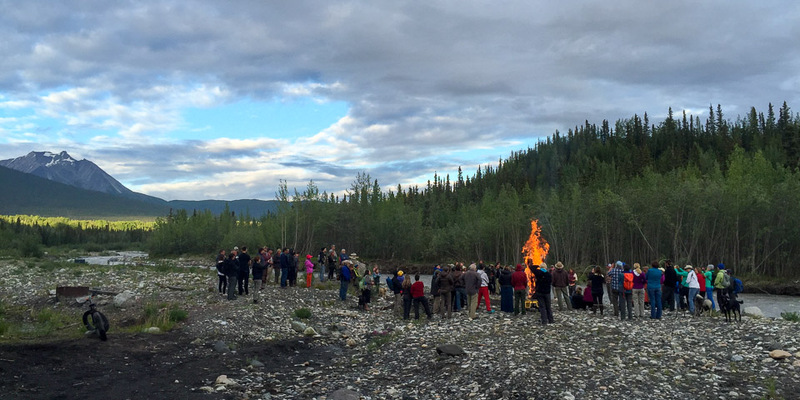 On the evening of June 20, the longest day of this year, McCarthy turned out for the burning of a straw effigy, the expressed purpose of which was to bring people together in solidarity for the stewardship of Alaska’s water resources. For the curious, legal sunrise for McCarthy was 3:56am, and the depth of sunset crested at 11:21pm, totaling 19 hours and 25 minutes of light – not including the after-dusk/pre-dawn glow that ebbs but never goes. Summer Solstice effigy burning near McCarthy Creek. Last but not least, and ranking in as perhaps the coolest perk of any job I’ve ever heard of, Wrangell Mountain Air offers empty “flight-seeing” seats to its employees free of charge. Two weeks ago I got to tag along on a 35 minute flight through Kennicott Valley, and it went well. Pictures can not communicate the size of these mountains. Large mountains that are far away appear to be medium size mountains that are a medium distance away. In the above picture the snowless peaks in the foreground to the left are around 6,000 feet above sea level. 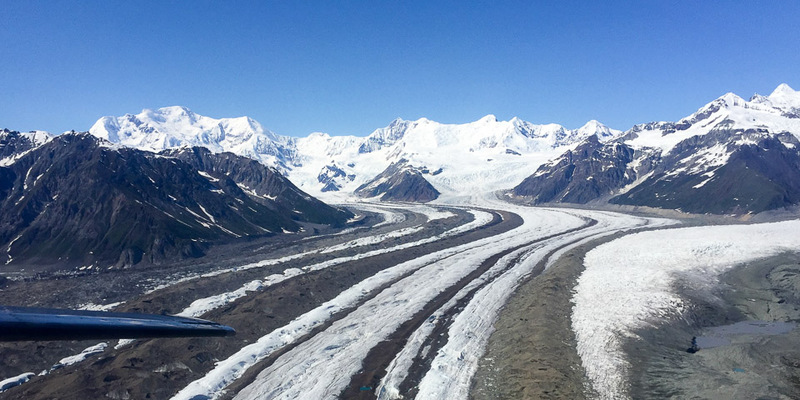 Mount Blackburn (background left) is the tallest peak in Wrangell St. Elias National Park and the 5th tallest in the US, topping out at 16,390 feet (5,000 m) tall. That’s a 10,000 foot change between a thumbs-width difference on your screen. The enormity sinks in only when you realize how far away the mountain remains after flying towards it for 15 minutes. My video is grainy, but know that it was crafted with love. I just came back from my first visit to Alaska, and had the honor of staying four nights in McCarthy. My brother lives in Anchorage, and has a friend who owns property in McCarthy. So, as you know, we were allowed to drive into the town. I fell in love with McCarthy and with Alaska almost immediately. I can’t wait to go back. Thanks for the feedback Sara. Yeah there’s something special about McCarthy. I think it’s because no one is “just passing through” town. It’s so far down a one way road that everyone who goes there is there intentionally. Artistic types and adventurers blend together in a way that I haven’t come across elsewhere. Good luck with your writing. 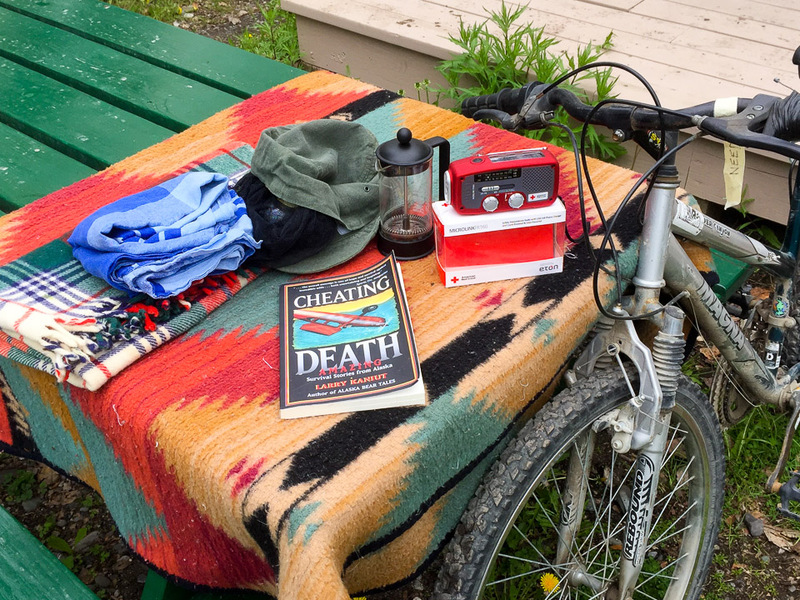 I’m realizing more and more that writing and traveling may remain an amateur effort for me, and while that’s not ideal, I can’t complain.